There is still a month left in the college football season, but it wouldn't be an exaggeration to say that this game is probably for all the marbles in the ACC Coastal Division. Miami hasn't lost this year, and Virginia Tech's only loss has come to Clemson. If Miami wins they will have run away from the pack and will have all but clinched a berth in the ACC Championship Game - they'd have a two-game lead with three games to go. If Virginia Tech wins they'll be tied with Miami and have the tiebreaker in their back pocket. Both these programs are going through pretty dramatic rebirths under hot new coaches, and both could use a statement win here. It's a game with no shortage of drama. And it's been a long while since that has been the case. This is the first time since 2010 that these annual rivals have both been ranked. Back then Virginia Tech had the higher rank at 14. This year they have the lower rank at 13. The first thing that stands out when you look at the game is that Virginia Tech has a defensive edge. They are top 10 in total yards, second nationally in points allowed, and well ranked in most categories. When you look closer, though, it's not quite as impressive. Their last three opponents have been Duke, Boston College and North Carolina, so because this is football and not hockey they haven't exactly been challenged lately. They have two shutouts, but against Old Dominion and Delaware they mean little. And a trip to East Carolina wasn't tough. They have played only two real games this year, and the opposing offenses did fine - West Virginia tallied 24 in a loss, and Clemson won with 31 points. It is far from impossible to imagine Miami having a decent offensive day. Of course, it's not like Miami is proven and potent offensively, either. They are barely in the top 25 in yards, and below that in several offensive categories, and they have played a schedule that makes it look like the Hokies have had to run the gauntlet. The toughest test that Miami has had this year is Florida State, and we know how unimpressive they are this year. Miami QB Malik Rosier is a junior, but he is not progressing at the rate that would be ideal in his first year as a starter. Last time out against a really bad North Carolina team he completed a season-low 42.1 percent of his passes, and Miami won by just five as 21-point favorites. This Hokies defense may not be as elite as the numbers suggest, but they are heck of a lot better than UNC, and that could be a problem for Rosier and company. As big of a concern from that last game as the performance of Rosier was their running game. Mark Walton was off to a great start at running back, but he's hurt. Travis Homer is doing a solid job in replacement, but against a UNC run defense that ranks only 108th in the country in rushing yards allowed, Homer had just 40 yards, Rosier had 20, and the rest of the team had just two. Homer's production has fallen in each of the last three games, so it is far from certain that he will have a strong game here. The game opened with Virginia Tech favored by 2.5. It has bounced around a little bit, but is again available at 2.5 as I write this . Sixty percent of bets have been on the Hokies, so we won't see dramatic movement, but we could see the key number of three in play. The total opened at 47.5 and has crept up to 50. 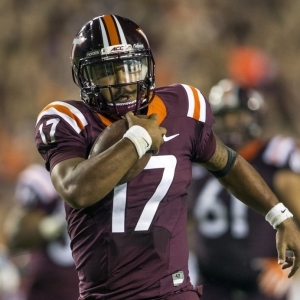 The Hokies are 9-3 ATS in their last 12 games overall and 5-2 ATS in their last seven following a straight up win. They are 8-2 ATS in their last 10 played on grass. The Hurricanes have not bounced back well - they are just 2-5 ATS in their last seven games following an ATS loss. They have, however, covered the spread in their last six games in November. I don't trust this Miami team. They don't have a real strength advantage on either side of the ball, and they have not played well recently against underwhelming opposition. They are not a 7-0 team, and I am more impressed by the progress that has been made under the new regime at Virginia Tech. I would much prefer to give up less than three points, but even at three the Hokies would be the solid pick.